Thanks Sally-I missed that so thanks for the news. Bei Bei - feel better sweetie! TY Gigi for the video ( DoxieMom19 ) and name the Giant Panda Twin Girls! I am going right now to vote!! Cub A is well known for the rather large patches of white fur on her heels. All of our cubs have had white heels, but the patches usually diminish as they age. Cub A's patches are the biggest we've seen of any cub. To add to the many things that make A stand out on her own, I noticed another cute quirk today! Check out the picture I took! She's got this random white hair growing out the tip of her right forepaw, where all the rest of her fur is black! How adorable! I wonder how long it'll stay there? On Sunday afternoon, Cub B had a grand adventure! Lun Lun had just finished nursing Cub B in Den 1 and left in search of bamboo in another den. Cub B was not pleased with her mom's decision, so she started scooting around the den and vocalizing ... loudly. After a couple of minutes, Lun returned to Den 1, sniffed her cub, and then apparently decided that Cub B was just fine because she sat down a short ways away from the cub. Cub B got even louder, but Lun held her ground. It seemed like Lun was challenging Cub B to come to her. Cub B scooted all the way down the hallway (about six feet!) yelling at her mom the entire way. At one point, she stopped a couple of feet away from her mom for a quick breather. She laid there with her head in the air just yelling and staring straight in her mom's direction! Don't worry; when she made it to Lun just a minute later, Lun scooped her up and laid down with her for a nap. I can't believe how quickly these two little girls are growing. Time is just flying by! Happy Thanksgiving (a little late) from the nursery! Here at Zoo Atlanta, and specifically in the panda building, we have so much to be thankful for this year. 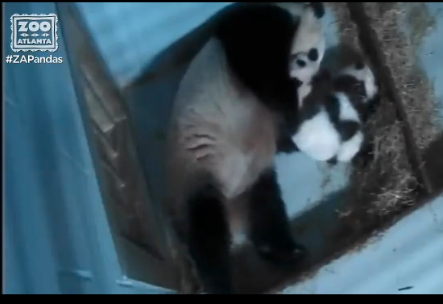 We are so thankful for happy, healthy panda twins and a great momma bear who is so good at her role. We are thankful for all of the great staff that work so hard to take care of all of the animals and make our 24 hour nursery shifts possible. Taking care of these little girls is a big team effort for our entire department, not just the panda staff. I don't think I could ever rave enough about how great everyone is. We have such an amazing team. We are also so thankful for all of you. For everyone who reads our updates, follows the bears on PandaCam, donates to the Zoo and comes and visits in person. You all are such a valuable part of our conservation mission. We wouldn't be able to do what we do with out you. Thank YOU! Now, I'm sure you're ready for some cub updates. They are growing like weeds, but that's not new to you. I thought I would share an updated photo of Cub B's gums. As you can see her teeth are getting closer and closer to the surface. They could erupt anywhere between now and about 120 days. It looks like she has a little bit longer to go. This was a great picture of her yawning during a weight check. You can also see how sharp her claws are. These are very helpful in helping her navigate her way through Lun's fur. The other picture is just cute. I couldn't resist. Oh. My. Goodness! I am gone one week (to attend a professional development class) and come back to huge, wiggly/squirmy, able-to-grip, on-a-mission-to-figure-out-how-to-use-these-legs baby pandas! When I went to swap the cubs for the first time after coming back to work, I was pleasantly surprised to discover the cubs are mastering the art of "gripping" with their front legs. It's not nearly as easy to manipulate them as it was a week or so ago. This of course brought back many memories of the Meis and I know all too well that they're just now starting to enter the phase where they'll start testing the boundaries of their world as they start exploring more and more. "The cubs are continuing to develop big personalities, and one of my favorite parts of that is watching how Lun Lun interacts with each cub. Cub A is a little more feisty, and Lun Lun tends to wake her up for nursing sessions with gentle play bouts. In the last week, much of the play that we have seen has been between Lun Lun and Cub A. Cub B is much more laid-back and can sometimes even be a bit standoffish. She hasn't discovered playtime as much as her sister (yet!) and prefers to explore her surroundings instead. Cub B's personality also means that if Lun Lun wants to enjoy a quiet nap with one of her cubs, Cub B is most likely to be the cub she naps with. Of course, they also do a good job of swapping personalities every now and then too!" "The cubs are 90 days old! Recently, the cubs are beginning to notice and interact with items in their environment, and they are realizing their mother is more than just a milk bar. We have seen Lun Lun initiate and the cubs reciprocate in play behaviors. Lun Lun initiates play from the cubs by nibbling and nuzzling them gently. The cubs respond with paw swatting, kicking, rolling, and mouthing. Play rarely involves vocalizations unless somebody bites too hard! Play behaviors are important developmental exercises. In addition to entertainment for the cubs, play behaviors build muscles and synapses, and prepare the cubs for future social interactions with other pandas." DoxieMom19 has another video of Lun Lun exhibiting her exellent mothering skills. As they swiftly approach their 100-day milestone, both cubs are working diligently on their mobility. Since they have mastered scooting, they have decided to skip crawling and go straight to walking. Neither has taken a first step yet, but both girls have stood (very briefly!) on all four feet. They are so much more active now and can be seen working their legs, scooting and trying to stand frequently. In the past, we tried non-slip grip pads on the floor of the nest box to help the cubs get some traction as they are learning to walk; however, these grips did not seem to make any difference, so we have not replenished them as they have worn away. All of Lun Lun's cubs have learned to walk as their legs have the gained strength needed to do so, and these girls are right on track! Check out the video of Cub A on Zoo Atlanta's social media networks! Many thanks Gigi for the updates...I voted!! Thanks from me too Gigi! Any word on our twins across the ocean!!!! They should be out of quarantine; I think. Actually, there is a video of the girls from November 17 on ZA's facebook page, Sally. They look pretty content eating bamboo. Hope all their transition is going more smoothly. I am glad they have each other. This little one has no idea of the excitement to come in about an hour. One cubbie still on the cam so I wonder what is going on with the 100 Day celebration. I can't find any update from ZA's website or FB page. 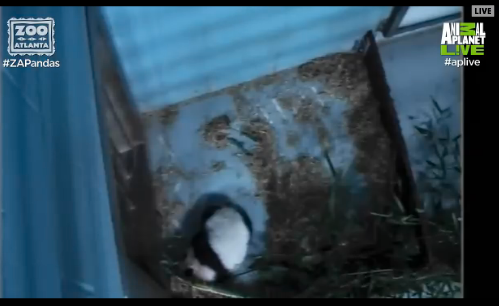 At first I thought the panda cam may have been stuck, but the little one just wiggled. "The only giant panda twins in the U.S. can officially shed the alphabet letters A and B in favor of their new names: Ya Lun and Xi Lun. The names were revealed at the twins’ 100 Day Naming Celebration on December 12, 2016, at Zoo Atlanta. 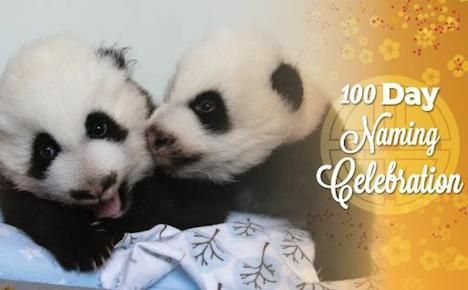 The 100 Day Celebration, which has been followed with all seven Atlanta-born giant pandas, is an ancient Chinese tradition that holds that when a child reaches the 100th day of life, he or she has survived the fragility of infancy and may be considered on track for a successful future. Ya Lun’s and Xi Lun’s festivities opened with a performance by the Wesley International School Choir. Remarks followed from Raymond B. King; Xie Fei, Culture Counselor from the Consulate of the People’s Republic of China in Houston, Texas; and Hayley Murphy, DVM, Vice President of Animal Divisions at Zoo Atlanta. The banners bearing the names were revealed by the Zoo’s giant panda care team, followed by a celebratory traditional lion dance by the Chien Hong School of Kung Fu. The animal guests of honor were not present to meet their fans; the duo is still learning to walk. Ya Lun and Xi Lun are expected to make their debut in late December 2016 or January 2017. Take a peek at the pair on PandaCam hosted by Animal Planet L!VE at zooatlanta.org/pandacam. 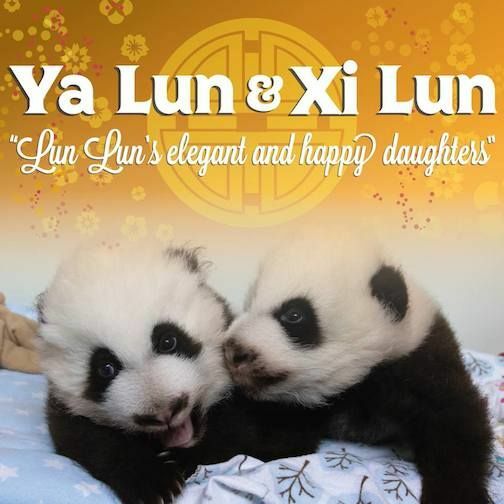 Ya Lun and Xi Lun play important individual roles in one of Zoo Atlanta’s longest-term conservation collaborations. Giant pandas represent the Zoo’s most significant financial investment in wildlife conservation, with over $10 million contributed in sustained support for wild giant pandas. The International Union for the Conservation of Nature (IUCN) downgraded the giant panda’s status from “endangered” to “vulnerable” in September 2016, but the species remains heavily reliant on conservation programs. Fewer than 1,900 giant pandas are estimated to remain in the wild in China’s Sichuan, Shaanxi and Gansu provinces, where they face continuing threats from habitat fragmentation and habitat loss as a result of deforestation and other human activities. More than 1,200 of China’s remaining wild giant pandas live inside nature reserves, eight of which are supported by Zoo Atlanta. Born September 3, 2016, the twins are the second set of twins for Lun Lun and the sixth and seventh offspring of Lun Lun and Yang Yang. Their older brothers and sisters, male Mei Lan, male Xi Lan, female Po and female twins Mei Lun and Mei Huan, now reside at the Chengdu Research Base of Giant Panda Breeding in China." Those were my pick for their names too! Look! 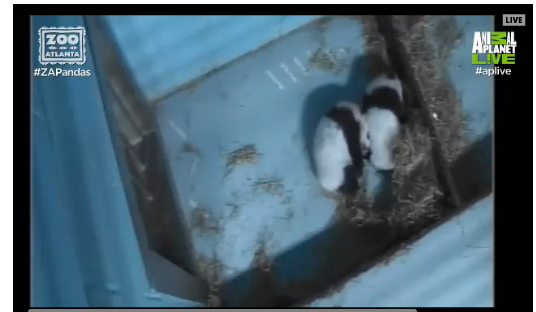 Ya Lun and Xi Lun are all snuggly together! Lun Lun is with the girls. She picked up one who is now nursing and getting a bath while the other sleeps.